Curator Michaela Hajkova, foreground, in the virtual world of Michael Bielicky´s ´This Year in Jerusalem,´ at the Prague Jewish Museum. In her mid-30s with huge blue eyes, long black hair and a model-like physique, the Czech curator’s outer beauty complements a steely determination to attract Jewish artists to Prague. In 2002, she founded the Prague Jewish Museum’s series, Jewish Presence in Contemporary Art. “People were used to something different from the museum, something traditional. But why shouldn’t we also let the Jewish present and all the questioning that goes with it have a voice in Prague?” she said. 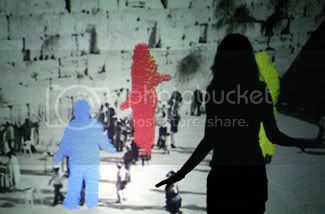 The projects Hajkova has promoted over the years — like Czech artist Michael Bielicky’s virtual portal allowing computer-generated interaction with museum-goers in Jerusalem — are a far cry from the traditional Judaica of the museum’s core collection. Andy Markowitz, an American living in Prague, finds such projects refreshing. He was particularly inspired by “Layered Histories,” created by Cynthia Beth-Rubin and Robert Gluck, which tells the story of a 13th-century illuminated Torah through mood music and shifting images. Viewers control the images and sound through touch. Travis Jeppesen, a Prague-based art critic, has attended every exhibition curated by Hajkova over the last three years. “She is light years ahead of everyone else in the Czech art scene,” he said. “Her thinking is rooted in an international rather than a local approach, which is extremely important for the Jewish Museum if it” does not want “to be a relic of a supposedly dead European culture,” he said. Hajkova is not afraid to choose artists who will cause a little trouble. A show by Mel Alexenberg, “Cyberangels — Aesthetic Peace Plan for the Middle East,” made the point that Arabs view Israel as an “alien presence that they have continually tried to eliminate through war, terrorism and political action,” according to the show catalog. This message drew an angry response from at least one audience member at a discussion with Alexenberg. “I think she was maybe an activist and she kept asking about equality for the Palestinians,” Hajkova said. Nonetheless, his respectful use of Islamic art patterns and quotations lend Alexenberg’s digital images a complex layer of beauty and provocation. Hajkova is a do-it-yourself curator who works weekends and nights on installations. In her spare time, Hajkova’s reading can run from the urban humor of Heeb to the feminist observations of Lilith. Her perfect English confuses Czechs, who sometimes think she is American. Most of the contemporary art Hajkova brings to Prague is displayed in the museum’s Robert Guttman Gallery, entered from a tiny street behind the main building. In contrast to the museum’s traditional visitors, who are in the large part foreign, the gallery draws a hip Czech crowd with an interest in Jewish themes, modern art or both. The gallery contrasts to the ancient synagogues and twisting gravestones that have long been the museum’s selling point. “The museum is now a hundred years old and has to move on with the times,” said Petr Brod, a veteran Czech broadcaster, historian and Jewish culture buff.